Create new contracts based on templates. Request draft approval or external approval. Provide on-going management once contracts are approved. Once a new draft contract document has been created or uploaded, the contract approval can be started. 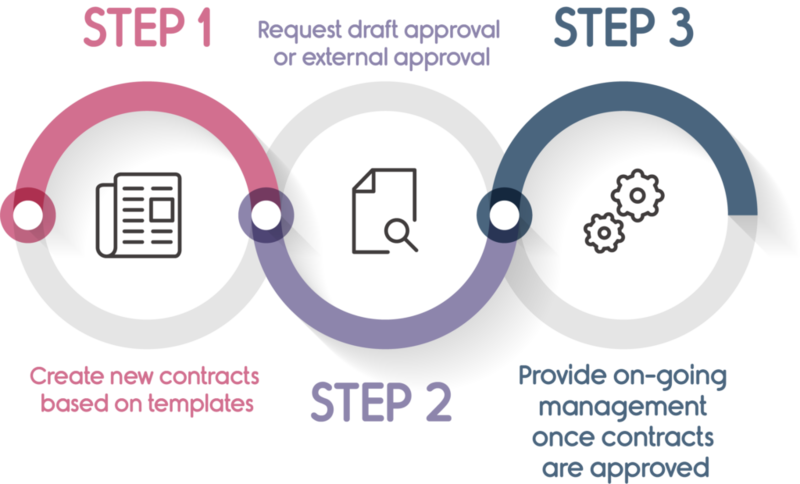 The contract type typically determines the related workflow which can be defined during approval. After approval, the contract document will appear in a list of pending approvals. Anyone responsible for approving the contract with then receive an email notification in order to review the document. Once logged in, you can review all the pending approvals that have been assigned to you in your dashboard. The format, layout and text of the documents are all customisable, and refer specifically to contracts within the contracts system. Looking for a Contract Management System? Chat to one of our experts to find out how our SharePoint Contract Management Software could work for you. Simply fill in the contact form to get started. Once a contract is approved, it will appear in the published contracts library. A review date will be automatically assigned based on the contract type or manually defined depending on the organisation’s requirements. Full visibility is provided through our interactive dashboard, with provides on-going management of all approved contracts. This Office 365 Contract Management Module has exactly the same capabilities as many stand-alone Contract Management Systems, but it has the additional benefit of being integrated with the Office 365 suite. And we’re not just saying that because it sounds good. Unlike other contract management software providers, this isn’t just compatible with some of Microsoft’s applications. It’s actually built inside the Office 365 cloud. This is SharePoint Contract Management for Office 365 – the proper way. Full integration and expandability mean you can add on additional modules and applications whenever you need them. On top of that, our contract management software utilises a Power BI dashboard which is pre-built to surface standard system related information. Easily customisable and remarkably responsive, this enables you to interact with your contract management system like never before. Templates can be used to standardise the creation of new contracts easily and efficiently. Shows when a contract has been viewed, modified, or changed including content & ‘meta data’ changes. Notifies a contract owner when a contract is due for review or expired. Allows customisation of pre-built reports which track the status of contracts & tasks. Notifications for any user tasks, contract reviews, and tasks reminders. Via simple sharing, or 3rd party contract signing systems such as Adobe Sign or DocuSign. Support and training available from our experts.